Alex Osterwalder’s Business Model Canvas | The science of enterprise—and doing good. The idea of a business model canvas (BMC) is central to what we know now as the Lean Startup Movement. It was, however, developed independently of Eric Ries’s Lean Startup concept by Alex Osterwalder (then a PH.D student) and his Professor Yves Pigneur, at the University of Lausanne, Switzerland. It does not get a mention in Eric Ries’s book (The Lean Startup), but it is central to, for example, Steve Blank’s new Lean Startup courses (info here). Osterwalder’s book was published in 2010. We know that Ries and his business mentor Steve Blank are widely believed to be the founders of the movement, but (in my humble opinion) the ‘movement’ would not exist without The Canvas. Meetups, perhaps the most extraordinary feature of the Lean Startup Movement, and which are, perhaps, what makes the movement ‘a movement,’ would not happen without the Business Model Canvas. In truth it would be difficult to imagine a meetup without the BMC. So what is it? Ideally, it’s a BIG piece of paper (at least A3, preferably bigger) with areas marked off according to the figure below. Even if you have a fast laptop, use paper. It lends itself to spontaneity and creative acts, and faster interaction.You can get your own ‘official version’ here. The Canvas is used to create quick and dirty, or a rough and ready concept of a business or any other type of organisation, even a project. There are a huge number of completed canvases on the web, here are just a couple. There are also videos on youtube by Osterwalder and others. My view might be a little bit different. You can make an educated guess from these two examples that using the canvas is a little different to the usual approach to business planning, or enterprise education. Completing the canvas is often a creative group exercise, highly interactive with ideas flowing freely. However, you should never do it alone. In fact you can never start a business by yourself. There’s always the person who you wish to do good for, and besides them there may be ‘passive sponsors, such as your spouse, or the auntie who has some cash to spare who believes in you, whatever crazy idea you come up with. I will explain in further detail presently, but from the examples you can see there are 9 areas ready for you to complete with information from your research. Together, this information (this knowledge) should enable you to; i) define the purpose of the business, or enterprising project based on what’s called the value proposition, ii) define the organisation and extended network through which the purpose will be realised, hence iii) how money/revenue made from the total enterprise. Although many see the Canvas as an alternative to a fully detailed business proposal, or what I would describe as an invitation to invest aimed at a bank or similar single investor, it is not. For an ‘official’ viewpoint get a copy of Steve Blank’s Harvard Business Review article on the BMC vs the traditional business plan here. The BMC may have been developed a long way from Silicon Valley, but not so far from the day-to-day interests of Blank and Ries as technology entrepreneurs, because the research that led to it concerned the formation and growth of digital technology based enterprises. Blank says a business model describes how a company creates, delivers and captures value. I think this is a rather polite or euphemistic (indirect) way of saying it’s how to make money by selling something people feel they need—like a solution to a perceived problem. To put this another way. It’s how to make money out of doing good, which echoes what I’ve said elsewhere in this blog about enterprise. A more detailed definition is furnished by Osterwalder et al (2005, p 17). 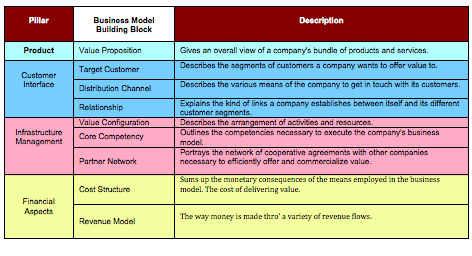 A business model is a conceptual tool that contains a set of elements and their relationships and allows expressing the business logic of a specific firm. It is a description of the value a company offers to one or several segments of customers and of the architecture of the firm and its network of partners for creating, marketing, and delivering this value and relationship capital, to generate profitable and sustainable revenue streams. From this somewhat academic description it’s not obvious what a business model is so I’m going to unpick it and represent it in a different way. First, I love the idea of conceptual tools. I first came across the idea in a book by Gerry Rhodes called Conceptual Tool Making. It was based on 15 years of research into problem solving methods at Phillips in Eindoven, although the author/consultant was British. A conceptual tool is a kind of instrument of the mind, but like a real physical tool it can be used to act on something to produce something else of greater value. A conceptual tool also acts as a learning tool. The BMC, then, is an instrument used to gain greater knowledge of a proposition around which one might want to start a business. It can also be used to generate brand new ideas for products and services, upon which a business might be founded. As I said, its a quick and dirty way of testing one’s hypothesis about a prospective new enterprise, but one that can be refined to the point where all the information one needs to create a more formal document (an invitation to invest) is ready to be drawn into a more linear form. What a conceptual tool acts on is another concept or a model. This happens when doing comparisons. E.g., equating one scenario with another. The business and management literature is packed full of conceptual tools. For example, all the models that are made of manufacturing processes, and all benchmarks produced by analysing and describing ‘best practice’, are conceptual tools and they can help you learn. Probably the most talked about conceptual tools on MBA courses are those developed by the business strategist (and widely known Guru) Michael Porter. For example, he talks of three kinds of generic business strategies for making above average levels of profitability (profit per unit of sales income). These are put into a nice neat matrix which becomes a conceptual tool for helping you decide a strategy for making above average rates of profit in a particular industrial-market scenario. Is a strategy a business model? Not quite. I think it’s useful to think of the two as related but to think of the business model as a concept developed for a particular ‘company’ with a particular set of prospective customers in mind, which is designed to make money from a particular product or service (or combination thereof). The business model is the concept, but you’ll need a strategy for competing for customer attention and their hard-earned cash. You need a strategy for dealing with any actions you might anticipate from potential competitors. A strategy is laid over the model, but both determine the exact form the business organisation takes. It’s this relationship between the business organisation—the system—and the customer that I want to emphasise in this explanation of the business model canvas. I want also to get across the idea that the Business Model Canvas is a conceptual tool, or to be more concise, a learning tool, which contains a set of elements and their relationships, which when used to establish the raison d’etre of a new enterprise makes the process more creative, faster, and more fun. These elements are listed below, appear in the table, and their relationships are contained in the Business Model Canvas template itself. 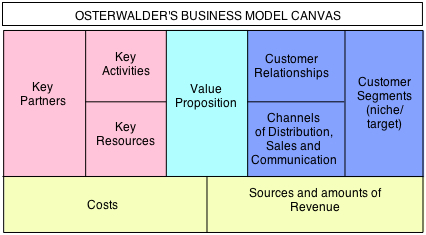 The Osterwalder-Pigneur (the Swiss Model) approach to business modelling has been developed from detailed research of existing business model frameworks, each of which features a different set of elements or model building blocks. Bullinger (2008), in a detailed review and comparison of models of innovation applicable to e.businesses (digital technology enabled businesses), found the Swiss Model to be comparable to the long established Balanced Score Card (Kaplan and Norton, 2006). The list immediately below indicates four ‘pillars’ or foundation stones of the canvas. and nine elements found drawn from a review of 14 existing approaches to modeling on which the Business Model Canvas is based. You can refer to the canvas above to see how the ‘pillars’ are arranged. I want to emphasise here that there’s absolutely nothing new or innovative in the Osterwalder-Pigneur model of business creation. What is highly innovative is the presentation of the ‘pillars’ in the form of a CANVAS, which immediately changes the process of conceptualising a model of a business, or any other type of organisation public or private, profit or non-profit. The canvas just happens to fit perfectly with the principles of the Lean Startup process, especially the emphasis it lays on experimentation, hypothesis testing, and systematic learning. The four pillars are : Product/Service; Customer Interface; Infrastructure Management; Financial Aspect. Product/Service: The product embodies value. There are two kinds of value. Use-value relates to the benefits a user derives from using the product. Exchange-value relates to the price at which a potential user is willing to pay to have the promised benefits. Exchange-value is the value derived by the business, use-value is derived by the user. Blank and Ries focus on the value proposition, which must comprise use-value and exchange-value. Use-value is dependent on the design of the product, the materials used in its construction and so on. These attributes are usually associated with product quality, and fitness for purpose. The nature of the product and its qualities determine the nature of the organization designed to make it, deliver it, support it in use, and so on. The relationship between product design and organization/business/enterprise/project design I will return to in the next section. By knowing a product, or just a product concept, it is relatively easy to come to know the industry and the market (source of demand) in which a new start business will find itself competing. Unless it is totally unique, a product will often prompt connections with similar products, ones with a similar function or use. E.g., if you plan to design and make a new kind of computer, you will probably already know the other computer makers, what kind of products they offer, and how they differ from yours, from which information you might be able to work out the benefits (the value) your offering might make over and above the ones from existing companies. A systematic way of getting to know an industry and how existing companies compete within it has been devised by Michael Porter and is another framework like conceptual tool called Industry Structure Analysis, which identifies 5 forces or sources of competitive pressure existing and companies new to an industry might anticipate. If you are thinking of starting a new small business then you will be a New Entrant, and Porter explains how such a company can begin to compete for market share against bigger and more powerful players. If, however, you are proposing a very novel product, you might have the potential of disrupting and existing industry. This is what Amazon.com did when it entered what was, essentially, a retail book industry. Amazon’s business model was originally to make money by selling real books online, instead of from a real store. In my opinion, the remainder of the ‘pillars’ are to do with creating or designing the organization that will realize the value inherent in the product design (the solution) for both the customer (or user) and the business owners. Customer Interface: Who the company’s target customers are, how it delivers products to them, and how it builds strong relationships with them. If you follow the principles of the Lean Startup approach, you will know who your customers and your potential customers pretty well. You’ll know what they desire/need/want and what they are prepared to accept in term of a minimally viable solution. You will have ‘got out of the building’ and engaged potential customers/users in a series of conversations. Knowing the Business Model Canvas will help you ask the right questions. You need to have some idea of how your customers/users would like to be served, supported, and engaged with before being able to establish the activities required to do so in a way that creates a valuable relationship based on the creation of exchange and use-value. This is the next stage. Infrastructure Management: Rather than the term used by Osterwalder and Pigneur, I much prefer to think of this ‘pillar’ as the organization, or, better, the system, that realizes the value inherent in the product design/service. As the table below indicates, this ‘pillar’ is subdivided into three areas. In the BMC template this is expressed in terms of key activities, key resources (human and nonhuman), and key partners. This is the system that realizes the value inherent in the product/service. When it comes to establishing management controls of the business (which will be required as it grows) the key activities become the foundation of ISO standard management systems. Financial Aspects: Osterwalder and Pigneur break this down to what they call the the revenue model, which I think is an acceptable description. This would be equivalent to the source and amount of sales or revenue gathered, say, over a period of a year or more. In other words, the top line of a spread sheet which you might append to a conventional business plan and explain in the accompanying narrative. On the other hand, it’s much clearer, in my view, to think of ‘cost structure simply as the costs incurred in realizing that inherent product value. If structure comes into at all, it will be related to the pattern of costs as a particular distribution across the activities of an organization/system. 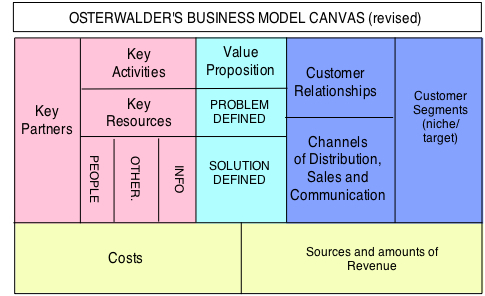 The Business Model Canvas is an alternative presentation of the table below. Pillars and their subdivisions have been put into the form of a template with a lot of space for you to write ‘stuff’ as you develop, with others, the concept of the organisation that will enable the realisation of that inherent value mentioned above. Let’s turn to the canvas itself. Although there are plenty of worked examples on the web, I’m going to go through a company with which, I’m certain, you will be very familiar as a user. It’s Amazon. This is the cvanvas I’m going to refer to. It’s slightly revised but in no way compromises or distorts the original. First what’s different is that I have subdivided key resources into three: people (human resources), other kinds of resource, such as nonhuman machinery, computers, building space, and information. Specifically the information one needs to control or manage the key activities, which might also be labelled key processes, or key (sub)systems. In this expression of the canvas, the areas are colour coded and relate to the table above. I’ll use what I know about Amazon.com to explain how it can be used. Amazon began as a book seller. If the founders of Amazon.com had used the BMC, what they might have done first is create a model for a conventional book retailer. For example, traditional book sellers know the inherent value of a book is realised by its user over the time it takes to read it. However, there are other sources of value inherent in books, such as how they feel in your hand, flicking the pages, contemplating the art work of the dust cover, or the satisfaction of creating a collection of books by a particular author. Books can also become like old friends you visit from time to time. Also, there are books of knowledge, of reason, and logic to which one can turn if so desired. There’s also the book buying experience itself, something traditional book sellers have also appreciated. The period just before the emergence of Amazon, saw book sellers attempting to ‘add value’ to the buying experience, for themselves and prospective book purchasers, by offering gourmet coffee and other drinks in a pressure free, contemplative intellectual café environment. Serving coffee and cake, then, becomes a key activity of the new generation of book sellers, along with other services such as having a wide selection of books available for scrutiny organised by genre and/or author, an ordering service for that obscure book or collectable that’s not on the shelf. The kind of relationship such businesses still have with customers is personal, maybe based on intimate knowledge of preferences, extending to personal services such as tracking down a rare book, or recommending new books. Key partners might have been publishers and other specialist book sellers, and IT companies that design and support the stock ordering system and customised services, and maybe the café proprietors (Starbucks?). Key resources would be knowledgeable sales assistants capable of using specialist computer software, and city centre premises of appropriate location, size and shape, which are the channels of distribution of the retailer (but not publishers). All this would cost something, and depending upon how the café services were operated, revenue might have accrued from several sources, selling books, coffee, and book procurement services. Quite obviously this kind of book retailing still exists. Those who want this kind of buying experience can still have it on most high streets and downtown areas. The one thing that Amazon still cannot realise for its customers is the feeling they get of possessing something in an instant of desire to purchase. See a book, feel a book, buy it. For the bookseller, this is the instant of exchange, and Amazon has taken this away from many of them. Huge numbers of exchanges are now enacted online, and, for the user/reader only delayed and displaced from shop to home or workplace. The incentive for letting go of that sweetly emotioning instant of exchange in the shop, is a much less expensive book. The reading experience is the same. The inherent value of the physical book is still available to the reader. When the purchase is for someone else, the situation is different. The instant of exchange would not be so personal: ‘So what does it matter if I buy online?’ (goes the train of thought). Reducing the purchase price of a product is a typical tactic of the new entrant to an established industry, which is what Amazon was. From the point of view of the book purchaser, the essential value proposition offered by Amazon was a reduction in purchase price. Ries might consider this the minimally viable product—the cheaper book. However, the service was quickly enhanced by having a wider selection of books available and a searchable online database, all of which prospective purchasers found useful and thus attractive enough to use again and again, while, to the extreme dissatisfaction of retail booksellers, still browsing in real book stores. I consider the business model to be how exchange value is created and realised, noting that without use value, there would be no transaction. What was Amazon’s model? In essence, Amazon adopted the kind of business model used by early supermarkets, which piled products high by buying in bulk. Bulk purchasing required bulk purchasing and so goods were sold at a high discount through no-nonsense, stripped back, retail outlets, more like warehouses than traditional shops. Amazon’s original business model, in my opinion, was to reduce the cost of selling by using the internet, which became a new channel of purchasing. This was how they created a low cost base which, in turn, allowed them to sell books at a discount compared with high street retailers. The nature of the internet allowed Amazon to have, very quickly, a global audience of book readers, from which it realised (eventually) a very high volume of online transactions. The very specific way of creating and realising exchange value required key partners in post and packaging, logistics, e.commerce platforms, and so on, but as internet technology developed Amazon were able to do much more than pile it high and sell it cheap, but you could have a go at creating a Business Model for the ‘new’ Amazon, using the BMC. There is an academic discipline, called actor-network theory the aim of which is to understand the phenomenon we call technology and its relationship with society at large. One of its proponents is the British sociologist John Law. He says, objects perform relationships. Alternatively we can say that objects precipitate relationships, or they trigger relationships. In the diagram below, which is explained in more detail here, you can see that the solution that emerges from the conversation between problem owner (customer) and would-be problem solver and acts to anchor them together in a relationship. I think its useful to consider this kind of relationship a socio-technical relationship, because although it is between at least two people (hopefully more if your are properly testing your concept of the problem and solution), it is founded on the basis of a technical solution. Likewise, out of the conversations on the left of the diagram between the would-be solution provider, the nascent entrepreneur or do-gooder, come more socio-technical relationships as they emerge by reason of creating and delivering a solution. A web of relationships of course is a network, which is a system with the purpose of delivering the solution. Both these kinds of relationships are indicated in the BMC. In the very early iterations of this cycle of business development, and if you has followed Steve Blank’s advice about getting out of the building to talk to prospective customers directly, the relationship formed would be quite strong, at least much stronger than with subsequent buyers of the solution. The BMC encourages you to consider the type of relationship the customer would value, and which you might value. Recognition that good customer relations are important in business development occurred well before Lean Startup, and is embodied in practices such as customer relationship management, which is a marketing subdiscipline. Again, there’s plenty written on this subject. 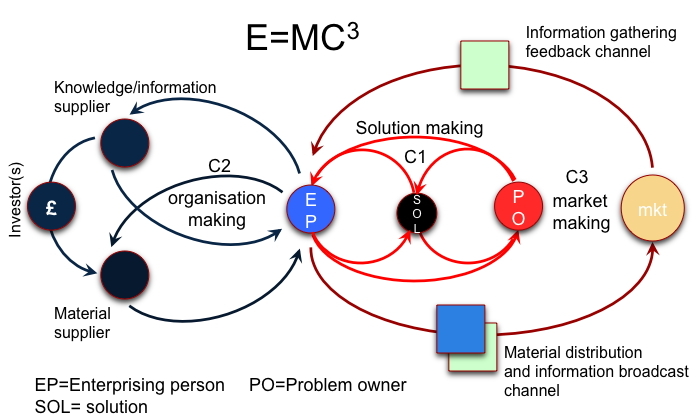 What is rarely written about, and which the BMC readily indicates, but is more explicit in the E=MC3 model, is that creating a business not only requires the design and development of the product that embodies both exchange- and use-value, but also the design and development of the organisation, or the system to realise that value, AND the creation of a market. This is a tall order, and not appreciated by, for example, those in governments who say there should be more innovative businesses, or academics who teach on entrepreneurship, or design courses. This is the definition of a business model presented earlier. The relationships referred to here are not socio-technical, but technical, that is, they relate to those between the elements of the BMC, which is an innovative translation of the table above. However, all relationships develop from the specific nature of the solution, or the value proposition. It is this that determines the nature of the activities, the key resources, and the key partnerships. Since the solution, or the value proposition will have been developed with someone with a particular problem, the nature of problem and its distribution through a society will determine the market segment (the particular people who might value your solution). Most new start businesses are based on one product sold to one segment of a society and so initial growth would come by selling more product to more people (see link to Ansoff Matrix below for an idea on strategy). In my experience, it would be unusual if a brand new start business began with a portfolio of products sold to different kinds of customers with differing problem, each of whom would represent a market segment, multiple distinct sets of solution users. Companies tend to grow in certain patterns, which I think all companies fall into. The patterns were first described by the business historian Alfred P. Sloan (after who the Sloan business school is named), but are also found in another conceptual tool called the Ansoff Matrix, which you can read about here. If you have multiple kinds of customers, or sell to different markets (e.g., UK market, and France), you have different revenue streams. Each segment (like Uk and France) ordinarily will require slightly different kinds of organisation/system to realise the ‘value proposition’. For brand new starts the BMC might have been ‘over engineered’. However, the principle stands, the design and making organisation/system, the marketing system (including channels of distribution, and information giving, procuring), and to an extent the legal administration of a new business are all determined by the nature of the solution or value proposition. This piece is already too long, but I will be adding to this coverage of the BMC through occasional blogs. For example, there is a connection to be made between the BMC and management system based on ISO Standards. For example, having an ISO standard quality management system could be a necessity for competing in some industry-market combinations. Also, one of the omissions of the original canvas was not to consider information (or knowledge) as a resource, which is something I would like to explore in relation to the slightly revised BMC above. Bullinger, C. (2008). Innovation and Ontologies: Structuring the Early Stages of Innovation Management. Wiesbaden: GWV Fachverlage GmbH. Kaplan, R. S. & Norton, D. P. (2006). The Balanced Scorecard: Translating Strategy into Action. Boston, Mass. : Harvard Business School Press. Pingback: Defining a Value Proposition using CATWOE | The science of enterprise—and doing good.